As you might imagine the response to my blog last week Dear CrossFit HQ and the conversations born from it were all over the map. I want to address a few of the things that came up over the next few blog posts. First, one of the comments I got over and over again was: “Thanks for starting this conversation”. These were so kind and I understood the intention behind them. But I want to make something really clear….this conversation didn’t start on Friday, Dec 8. And I am not the only one having it. Not by a long shot. I think I can safely say that I have been a leader and a lightning rod for this conversation for almost 15 years. I have been developing strategies to help women with pelvic health issues return to all kinds, and all levels of fitness longer than there have been blogs, social media forums and threads to share them on. I have been at it, long before CrossFit was a big deal. And my understanding, the strategies I use, have evolved. When I first started down this path….I gave out Kegels for incontinence and prolapse. That’s all there was. At the start, I gave out TA-isolation work for diastasis, too. That’s what we all did. I told women don’t do crunches. That’s what we all said. I told women who were leaking to stop running. That was the party line. I wasn’t sure what I thought the first time a patient told me she had deadlifted a crazy amount of weight during her pregnancy. I didn’t realize it at the time, but she was my first CrossFitter, more than a decade ago. When those strategies (isolation) didn’t work….I tried new ones. I evolved in my thinking. When those patients I told not to crunch, run or deadlift ignored me and did it anyway….it pushed me to come up with new solutions and question what I thought I knew. I evolved my approach. When I first started trying to have this conversation…there were a lot of folks open to new ideas, they were searching and trying things clinically too. And there were plenty of folks that weren’t open to it in both the pelvic health and sports medicine communities. I have always tried to walk the middle ground between both. Advocating for the relevance of pelvic health in musculoskeletal and sports medicine, while simultaneously advocating for sports and fitness within pelvic health. Overtime, not overnight, things have shifted. Beautifully, slowly and cautiously…..one conversation at a time, one seed planted at a time. Lots of folks have gone through the same evolution of thought I did when new evidence, ideas and challenges were placed before them. The fact that CrossFit was willing to engage in a conversation is a welcome step in the right direction to move the ball forward and begin to evolve the conversation from within their community. To move it from “it’s just pee” to “it’s a signal that you have an imbalance we need to address in order to help you perform better”. Different message. Evolution is the nature of medicine. Can you imagine being this guy!? 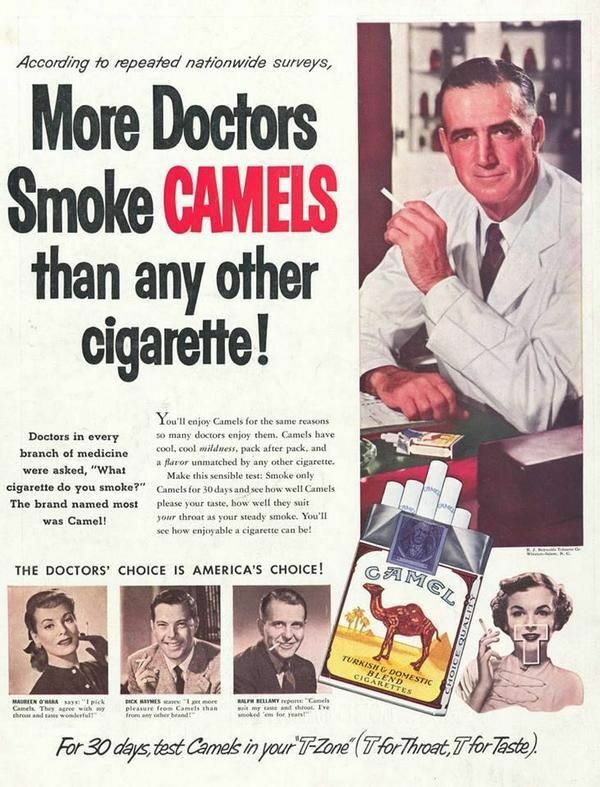 Doctors used to promote smoking and endorse different brands of cigarettes for heaven’s sake. I am still growing and learning with every new challenge to my thinking that comes my way. Let’s hope we can all give each other enough grace to evolve as we all/each learn more and more…me too. The conversations online in and around pelvic health and fitness/sport are numerous. There are many folks advocating for this in all areas of pelvic health, fitness and sport both on and offline. I am not standing in this space by myself, there are lots of voices. All working in different ways to bring about a truly global mission: to keep men and women enjoying, participating in, and benefitting from fitness over their lifetime without limitation of injury or pelvic health considerations. That seems like a goal we can all get behind and agree on. Here is a list (not exhaustive) of folks out there trying to change this conversation alongside me in all areas of fitness and sport. CrossFit has indicated that they encourage folks to connect with experts …..here are a bunch. Google them, follow them, see if they are local to you, reach out. The experts are telling you that you can do both…hit a PR, run faster, Zumba harder, Yoga longer….and stay dry. Not here to condemn or do battle….we are here to help. Search on the social media hashtag: #pelvicmafia (its sort of a bat signal) to help you find a practitioner or at the least someone who is talking about issues like these. Join us in the evolving, ongoing conversation both on and offline to help keep men and women participating in fitness! PS: I will be posting the twitter conversation shortly in it’s entirety and a few more blogs on topics that have come up from the discussions and questions that I have received! Don’t wanna miss a post or online course updates…join my newsletter here. I’m right here with you all! Fantastic article and keep preaching for health and function. Jolene Faught, PT, WCS, the evolution continues! Well done #pelvicmafia!